Late last night, Yahoo! Sports’ Pat Forde reported that the NCAA is investigating Kansas big man Cliff Alexander for ties to an agent and possible impermissible benefits received by his family. Alexander has sat out Kansas’ last two games in the interests of protecting his eligibility while the NCAA works with Alexander to resolve the matter. Aside from the nature of the possible benefits, the big question is how long Alexander will continue to be sidelined. According to Forde’s sources, the freshman has hired an attorney, a move which, while may be advisable for Alexander, is reportedly slowing the investigative process. 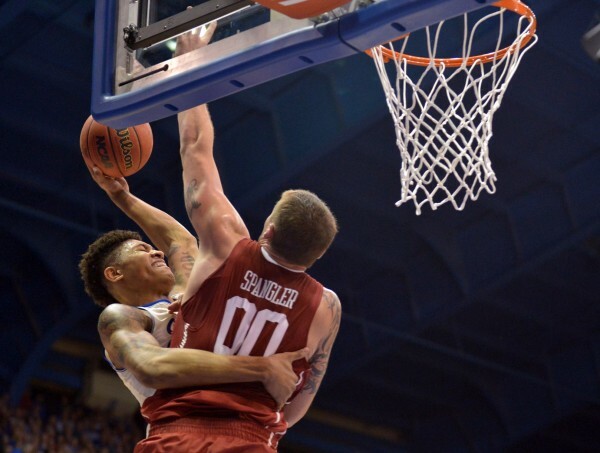 As we’ve said ever since news of the investigation first broke last Saturday, Alexander’s availability is important if Kansas is to make a deep postseason run, but while the team would prefer to get a resolution soon, you just never know with the NCAA. The legend of Baylor big man Rico Gathers continues to grow. 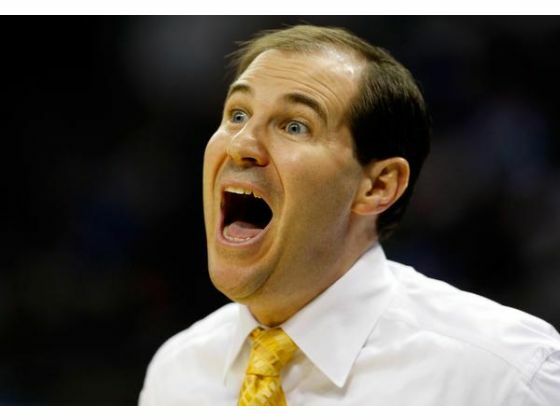 Gathers is a focal point in two national stories that have dropped recently. The first is a terrific piece by CBSSports.com‘s Matt Norlander chronicling his experience (along with those of other players) balancing the grueling demands of NCAA competition with the challenges and blessings of fatherhood. The second is an in-depth look by Bleacher Report‘s Jason King that touches on Gathers’ fantastic season to this point, his outstanding athleticism and the attention he’s drawn as a potential NFL prospect. Both are well worth your time. While there has been no shortage of storylines in the Big 12 this season, Gathers’ emergence into the national spotlight has been one of the year’s highlights, with his play crucial in keeping the Bears relevant in the face of significant roster turnover. The odds are that Gathers will be around for another season, but the sooner you appreciate everything he brings to the table both on and off the court, the longer you’ll have to enjoy it. Ames Tribune beat writer Travis Hines emptied out his Iowa State mailbag, providing some great insight into the state of the Cyclone program as the team gears up for the postseason. While some have been quick to label Iowa State as fraudulent due to their inability to pass Kansas in the Big 12 standings with a roster that had the chance to do it, fans (or rather, fans whose questions Hines took a crack at answering) seem pretty optimistic, with many of their inquiries focusing on the Cyclones’ tournament ceiling, their chances of landing big recruit Cheick Diallo and the makeup of next year’s team. The Iowa State faithful brought a huge contingency to Kansas City for the Big 12 Tournament last season, so with another strong team this March, you can expect a similar level of support next week. Between widespread transfers and the appeal of the NBA, it’s become increasingly rare for a player to stay at one school for all four years, argues Ryan Aber of The Oklahoman. As such, Senior Day festivities don’t always carry the weight they once did, even in the case of Oklahoma, which has three players — James Fraschilla, D.J. Bennett and TaShawn Thomas — set to play their final home game tomorrow against Kansas. Of the trio, only Fraschilla, a walk-on, played all four years in Norman, as Bennett was a juco transfer and Thomas only came aboard this fall after spending his first three years with Houston. Whatever the case may be, Fraschilla, Bennett and Thomas should be extremely proud of what they’ve accomplished. While the Big 12 champion has been determined, a whopping seven of the other nine spots are still in question entering the final weekend. If you’re into seeding scenarios, Aber did the grunt work for all of us just prior to Wednesday’s Oklahoma State-TCU game. The Sooners and Cyclones could finish anywhere between second and fourth, Baylor can finish anywhere between second and fifth, West Virginia can finish in either fourth or fifth, Oklahoma State will finish either sixth or seventh, Kansas State can finish anywhere between sixth and eighth, and Texas will end the regular season in either seventh or eighth place. If you’ve watched even a half of Big 12 action, you know that predicting how everything will shake out is a fruitless exercise, so our advice is to just sit back and watch the madness unfold. We’re going to get four more weeks of it anyway. The always entertaining Kyle Porter of Pistols Firing recapped Oklahoma State‘s upset win over Kansas on Saturday. The Jayhawks played the first half about as well as possible, running out to a double-figure halftime lead while shooting 7-of-9 from three. The second half, however, went in the opposite direction. Turnovers were a problem, as that number ballooned to 18 (Jamari Traylor had six miscues himself), and the Cowboys found the seam by driving to the basket and drawing fouls (20-of-26 on free throws). With only two Big 12 losses, Kansas is still in the driver’s seat for another conference crown but it will face stiff competition as Iowa State (one game behind) and Oklahoma (1.5 games behind) jockey for position down the stretch. West Virginia won the opening tap and scored the first two points of Saturday’s game against Baylor in Morgantown, but that would be the last time the Mountaineers would hold the lead as the Bears went on a 23-1 run to coast to an 87-69 blowout victory. Baylor beats you with its offensive balance, as Rico Gathers (17 points), Taurean Waller-Prince (15), Royce O’Neale (15), Al Freeman (11) and Kenny Chery (11) all registered double-figure scoring. In the Bears’ current three-game winning streak, they have shot a scorching 45 percent (22-for-49) from behind the arc. Unfortunately, we figured this would start to happen to West Virginia. The Mountaineers’ conference schedule is so backloaded that a major slide during the rest of the regular season is very much in play. Baylor, meanwhile, will be tested this week, facing upstart Oklahoma State in Waco followed by big, bad Kansas on Saturday afternoon in Lawrence. A not-such-a-big-deal thing and a hope-it’s-not-such-a-big-deal thing happened to the Cyclones over the weekend. We’ll start with the first thing as Bryce Dejean-Jones came off the bench in Iowa State‘s win against Texas Tech. Fred Hoiberg attributed Dejean-Jones’ benching to tardiness, which, again, is not such a big deal. In his place, Jameel McKay owned the game to the tune of 17 points, eight rebounds, three blocks and two steals in 25 minutes. The other thing that happened was that Georges Niang headed to the locker room in the first half after experiencing soreness in one of his Achilles’ tendons. Niang returned to the game but nevertheless should take extra special caution with the knowledge of how serious Achilles injuries can be. It’ll be something to keep an eye on in the Cyclones’ Big Monday game against Oklahoma tonight and West Virginia on Saturday. Some big news was released on Sunday night as Oklahoma big man TaShawn Thomas will play in tonight’s showdown with Iowa State. Thomas, who had eight points and 10 rebounds in his 27 minutes on the floor, left Saturday’s game against TCU after getting hit in the eye in the second half. With all hands on deck for both teams tonight, there should be some fireworks in Norman. The college basketball world lost a giant on Saturday as former North Carolina coach Dean Smith passed away at the age of 83. Smith was a huge success — on and off the hardwood — from his 879 career victories, 11 Final Fours and two national titles to being a fearless advocate for civil rights in a place and time that was not conducive to his views. 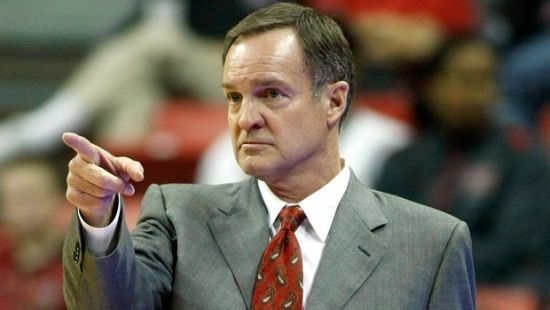 The countless stories of the influence of Smith have been the most magnificent part of the weekend, including one that Oklahoma’s Lon Kruger told to the Tulsa World. I won’t spoil any of it here, but the piece further underscores how well he treated everyone. Even opposing coaches. It’s a near-consensus this season that the Big 12 is considered the best conference in college basketball. As we approach the halfway point of league play, drawing a line between NCAA Tournament contenders and the rest has become an easier task. We all expected Kansas and Iowa State to reign at the top and Oklahoma State, TCU and Texas Tech rounded out the standings (sorry, guys). But the middle five conference teams have been the tough to forecast all season long. West Virginia is 6-2 in league play but still somewhat unproven, with four of those six wins coming against the Horned Frogs and Red Raiders. Texas, Oklahoma and Kansas State have all left something to be desired. The only middle five team to exceed expectations so far has been none other than Baylor. After finishing sixth last year, Big 12 coaches picked Baylor sixth again before the season began. At the moment, the Bears are in, you guessed it, sixth place. So how are they exceeding expectations? Because they lost Isaiah Austin, Cory Jefferson and Brady Heslip — three of their top four scorers from a year ago — and a slew of role players has been charged with taking on greater responsibility. Rico Gathers has been an anchor inside, grabbing more rebounds in a starter’s role (12.0 RPG) while sharing the wealth among veterans Royce O’Neale (6.3 RPG), Taurean Prince (5.7 RPG) and freshman Johnathan Motley (4.6 RPG). The graduation of sharpshooter Heslip left a gaping hole in the team’s outside shooting but that role has been supplanted by another trio of Bears. O’Neale has been a consistent outside shooting option since arriving from Denver (42.4%) and Prince is also capable from distance (40.5%), but the most improvement has come from point guard Kenny Chery (32.5% last season to 40.5%). It was a tale of two halves last night in Lawrence, as Kansas hit nine first half threes to sprint out to a commanding 51-32 halftime lead against Oklahoma, only to watch it disappear as the Sooners stormed back to take a four-point lead before collapsing at the end. Let’s consider four key takeaways from a game of several crazy swings. Fiery start fuels Kansas’ first half: Kelly Oubre got things going by connecting on a pair of early threes and the Jayhawks refused to let up on their way to 51 first half points. Although Oklahoma remained close for the first five minutes, Kansas would register a 16-0 perimeter barrage with nearly everyone contributing. This team is built to fire away from deep, but Bill Self has tried in vain to establish an inside presence even though he doesn’t have a true back-to-the-basket big man (however, Cliff Alexander may be developing into one, as we’ll discuss separately below). While Kansas’ scorching first half is a statistical outlier, it underscores the fact that the Jayhawks are at their best when they utilize their outside shooting prowess. Don’t overlook Buddy Hield in the Big 12 POY race: This conference is filled with scorers from Marcus Foster to Phil Forte to Georges Niang, but the Sooners’ Buddy Hield may be the best of the bunch. His 26 points were a game-high and he’s now shooting a superb 60.5 percent on twos in league action in spite of his 6’4″ frame, along with a 44 percent clip from deep in Big 12 play. Hield isn’t without his warts, though, as he tends to rush shots (especially in transition) and he could stand to share the ball a little more often with talented and effective teammates like Isaiah Cousins and Ryan Spangler. Still, the junior is an undeniable star, as evidenced not only by his huge game in arguably the most intimidating environment in college basketball, but his play all season to date. Nate Kotisso is a Big 12 microsite writer for Rush The Court. He covered Oklahoma-Texas in Austin last night. You can follow him on Twitter @natekotisso. We are four days into the start of Big 12 play, so naturally, now is the time to make quick declarations on how the conference will ultimately shake out. Until we make new ones on Saturday, that is. The box score will tell you that the Sooners played their most complete game of the season against one of their toughest opponents on Monday night. While it was an impressive victory, the reality is Oklahoma dominated Texas defensively in the first half and coasted in the second. 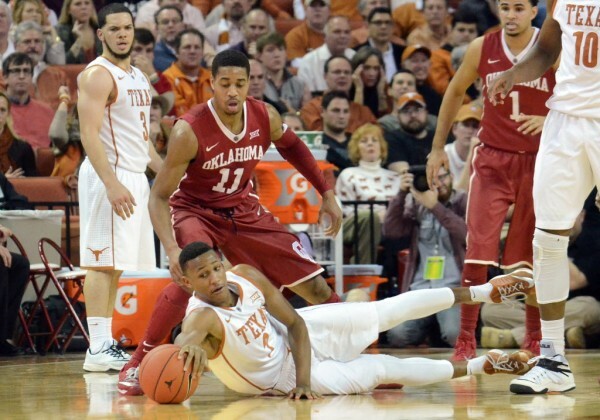 The Sooners forced nine of Texas’ 12 turnovers, scored 11 points off those turnovers, outscored the Horns in the paint by 10, and held the Longhorns to 14 points total — all in the first 20 minutes. At the break, Texas was left with six players each making one field goal to account for their 6-of-30 shooting, while the Sooners’ Ryan Spangler and Buddy Hield equaled that number with three makes apiece. Their size advantage on Texas’ guards with Hield and Isaiah Cousins allowed the duo to shoot over them to the tune of 4-of-10 from the perimeter. Eli Linton is a RTC correspondent. He filed this report after Oklahoma’s 73-63 win over Baylor. Saturday’s premier matchup — and the country’s only game between ranked opponents — featured #22 Baylor at # 18 Oklahoma in what amounted to two of the nation’s top defenses, and possibly the two best frontcourts in the Big 12. Baylor was the underdog surprise of the season going in. The Bears were selected to finish sixth in the Big 12 preseason poll, but came into Saturday’s Big 12 opener sporting an 11-1 record, including six straight wins. This was the perfect opportunity to showcase their great talent that has helped them rise above expectations. Instead, what we ended up watching was total control by Oklahoma, who won 73-63. The Sooners are starting to pile up wins against quality teams, and are looking more like one of the NCAA’s elite. As the Big 12 schools near the completion of their non-conference schedules this week, it’s a great time to catch up on where the league’s 10 teams stand entering conference play. Surely, this would be the year West Virginia becomes a factor in Big 12 hierarchy and they look like a serious one to this point. Meanwhile, Oklahoma has had a few hiccups in non-conference play but there is reason for optimism as the new pieces begin to settle into their roles. The Conference Catch-Up rolls on today with our last Catch-Up coming up tomorrow. When you’ve had the success and longevity that Bob Huggins has had in coaching, there are very few things left to prove. Perhaps rebuilding his alma mater into a contender in a new league was something worth going after and Huggins appears to have done that. 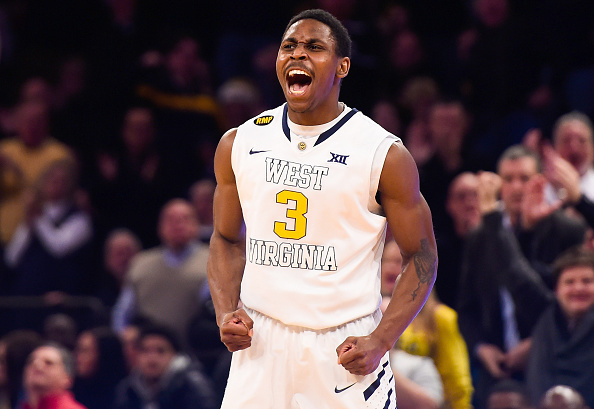 It was hard to expect such a quick start from the Mountaineers in 2014-15 considering two of their top three scorers from last season (Eron Harris and Terry Henderson) transferred out of Morgantown. With them gone, this has undoubtedly become Juwan Staten‘s team. The Preseason Big 12 Player of the Year Staten leads his team in scoring (15.9) and assists (4.3) despite playing on average seven minutes fewer than he did last year. The last triumph most remember WVU having on the national landscape was their Final Four season in 2009-10. What made that team such a difficult matchup for most were their versatile wing players. Guys like Da’Sean Butler, Devin Ebanks and Kevin Jones carried a lot of responsibility on a team that only used a seven-man rotation. Butler, Ebanks and Jones were all 6’7″ or taller, could score, rebound in bunches and committed to defending on a team that finished 23rd in the country in adjusted defense according to KenPom. The difficulty with this year’s team is their ability to wear down opponents due to Huggins’ pressure defense armed with a rotation that rolls ten guys deep. At this point, KenPom has WVU sporting a similar adjusted defense rating as 2009-10 (22nd) despite the Mountaineers averaging 13 steals a game, seven more than the 2009-10 team. In KenPom’s metrics, West Virginia is ranked No. 1 in the country in turnover percentage and steal percentage. More steals and turnovers have led to more easy buckets on the other end of the floor. West Virginia breezed through an average non-conference schedule with one minor speed bump in the form of a 74-73 home loss to a solid LSU team. The big question going into conference play is how long can they keep up their defensive pace against much tougher opponents? It’s one thing to post big numbers against VMI, Northern Kentucky or Marshall and another to do the same to Kansas, Texas or Iowa State. While Texas and Kansas have hogged the Big 12 spotlight so far, Oklahoma is starting to demand some attention of its own. Lon Kruger’s squad, which came into last week ranked #16 in the country, visited Tulsa on Saturday afternoon and left with an easy 87-68 win. 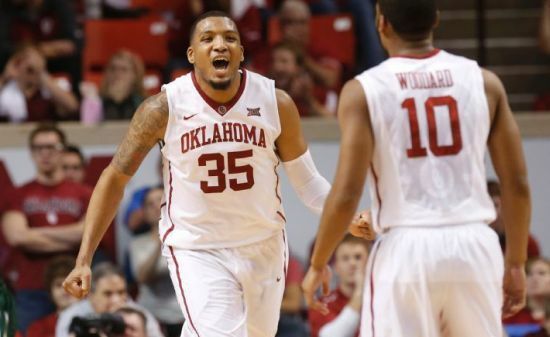 Oklahoma appears to have its best team since Blake Griffin was running the show. The Sooners’ defense is performing at a top-10 level this season, holding every team they’ve faced to fewer than 70 points, 36 percent from the field and 28 percent from three. That stingy defense is the main reason they continue to climb the national rankings and are demanding respect in such a competitive conference. Ryan Spangler is a Gonzaga transfer who plays physical defense in the post. He’s a great athlete who shoots a high percentage. He’s shot 50 percent or better in 32 of his 40 games at Oklahoma, and he’s shooting 64 percent from the field this season. Spangler is disruptive on defense and has a lot of athleticism for a big man.